Protect these gentle giants from wildlife trafficking with socks that benefit Conservation International. Some of the most intelligent and empathetic species in the animal kingdom, elephants are gentle giants that deserve our admiration and respect. Unfortunately, they don't always get it. 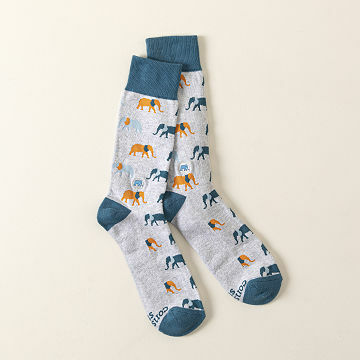 Fight back against the illegal wildlife trafficking that targets these incredible animals with this pair of organic cotton, printed socks. Each pair gives back to Conservation International, an organization that works every day to keep elephants safe. Made ethically in India with organic cotton. Machine wash and dryer safe. Do not bleach.